Purchasing real estate can be one of the biggest single investment you’ll ever make in your lifetime. Whether you’re buying new home construction or an existing home, there can be hidden defects. Some flaws are obvious, but many flaws take a trained professional to find them. The Cole Companies offers experienced professionals that are able to detect the most expensive problems like water/fire damage, mold, foundation cracks, insect damage, HVAC, plumbing and electrical issues. We strongly recommend that you attend the home inspection, so that we can tell you personally about the different part of your home. 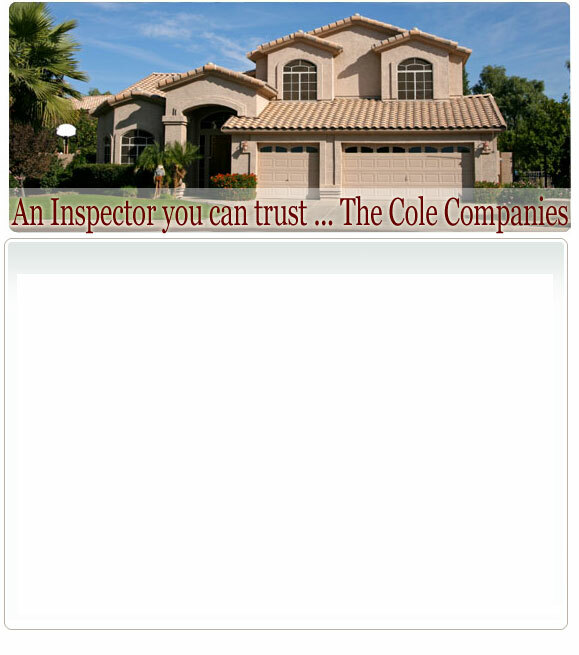 At the end of your inspection we’ll hand you a detailed home inspection report outlining the condition of the house. After talking with our inspector and reading the report, we feel confident that you’ll be able to make a knowledgeable buying decision. With over 25 years of experience under our belts, we feel confident that we can help create peace of mind for you! © Copyright 2009 The Cole Companies, All rights reserved.